Download and install the RabbitMQ server from the official website https://www.rabbitmq.com/install-windows.html (https://www.rabbitmq.com/install-windows-manual.html - manual installation guide). Download and install all the Erlang packages from the official website http://www.erlang.org/download.html. After installing everything, restart your computer. After restarting the computer, run the RabbitMQ command prompt (not as the administrator). You can find it in Start or by searching "RabbitMQ". In the RabbitMQ command prompt, enter the command: rabbitmq-server –detached. This command will start the server. If the server is already running, a respective entry will be displayed in the command prompt. 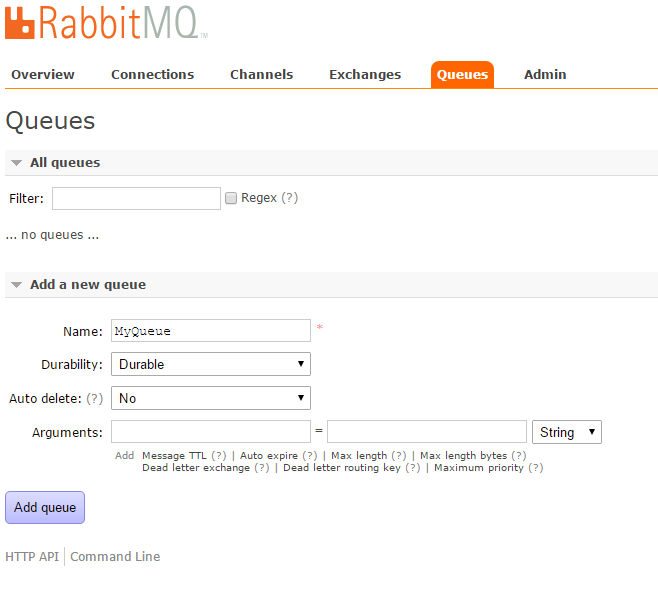 This server can be started from the Windows Servers (it is called RabbitMQ). 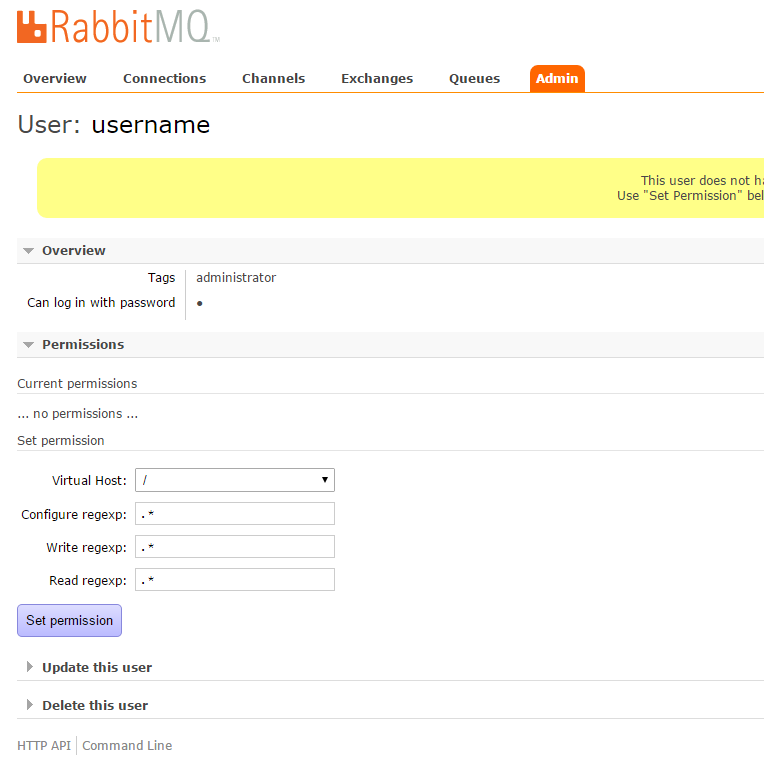 In the RabbitMQ command prompt, enter the command: rabbitmq-plugins enable rabbitmq_management. This command will enable plug-ins. Open the following URL: http://localhost:15672/ and sign in on the opened page (login: guest, password: guest). After signing in, create a new message queue on the Queues tab. Next, create a new exchange on the Exchange tab. The exchange must be of the direct type. 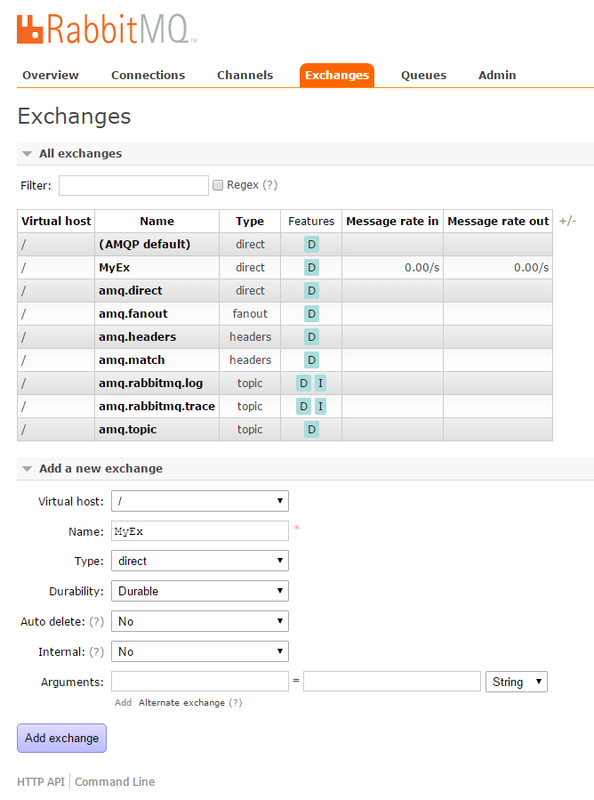 After creating an exchange, open it and bind it with a message queue. 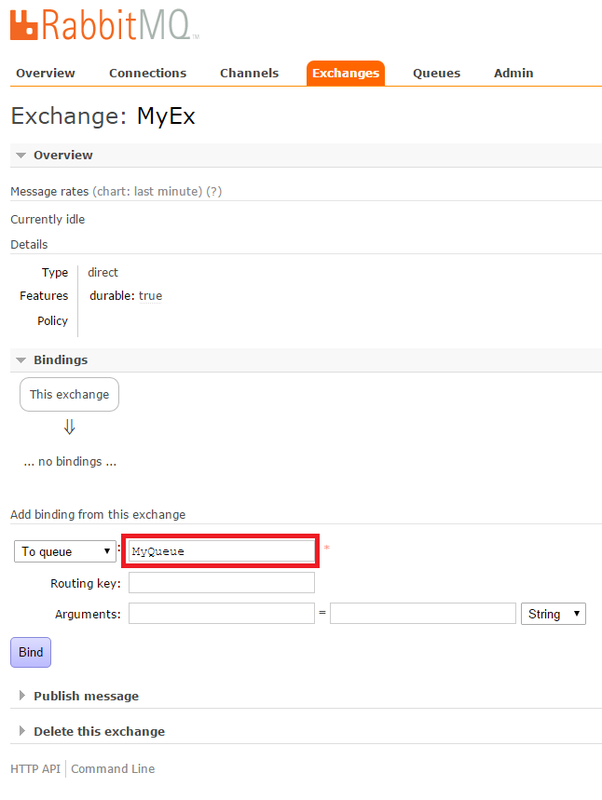 Open the created exchange on the Exchanges tab and specify a message queue name in the To queue field in the Bindings unit. Next, create a new user. 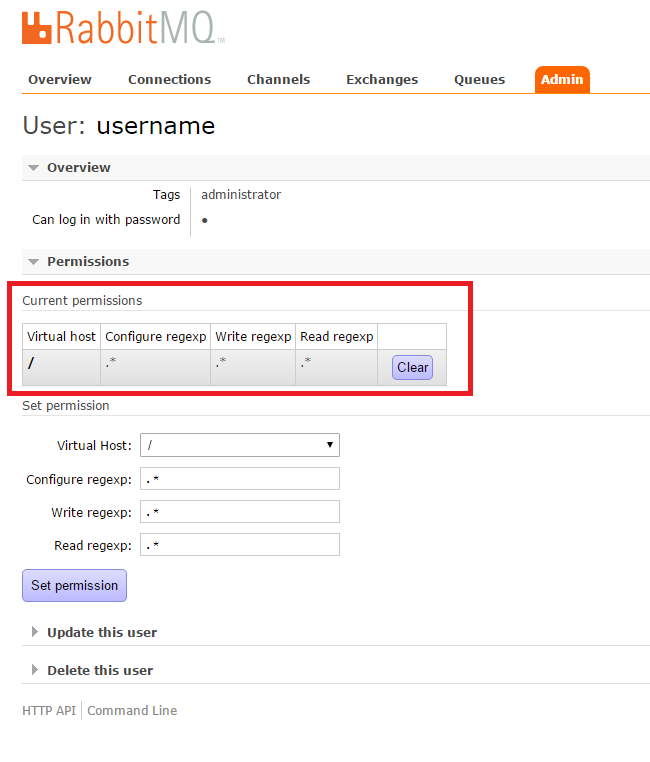 Open the Admin tab, specify a name, password and manually type the administrator tag in the Tags field and/or click Admin in the Set field. To save the changes, click Add user. Open this user profile and click Set Permission. The Current permissions table will be displayed. 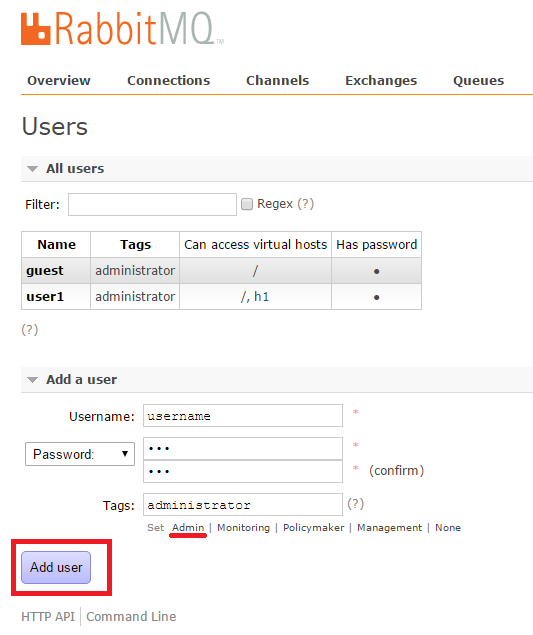 Queue name, Host (either localhost, or the server name), Port (by default, 5672), Virtual host (by default / if necessary you can create an add a new virtual host in the user administration panel, which will be specified in ELMA), Access Point Name (specify the exchange name), Queue Name (the one specified when creating a queue, which was bound to the exchange), Login (if the host name is = localhost, you can specify guest with password guest; if it is the server name, specify the created username), Password, if it is necessary to Use proxy server. If you need to stop the RabbitMQ, server, enter the rabbitmqctl stop command to the RabbitMQ command prompt. The server can also be stopped in the Windows services.